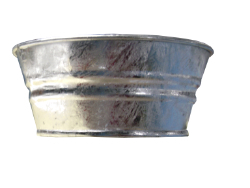 The galvanized mini tub is Ideal for crafts, gift baskets, or decorative arrangements. Fill them with candies, dried or plastic flowers, or gifts for a shower, house-warming party, and table decoration or as a door prize. Great for kid's crafts or projects! With your imagination and a Mini Tub, the possibilities are endless. All mini tubs are sold by the unit or in case lots of 12.